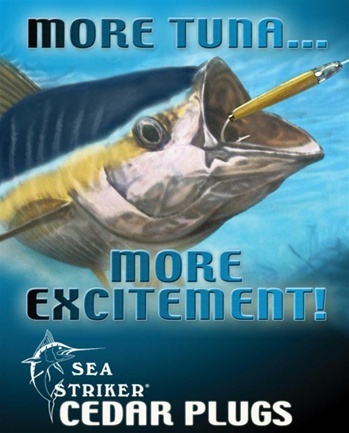 Sea Striker Cedar Plugs are the #1 tuna fish lure on the East Coast and are catching on fast around the world. Made of the highest quality red cedar, this lure is great for all gamefish. These 6-inch plugs are available rigged and in a variety of colors. Cedar Plug™ the number one tuna fish lure on the East Coast is fast catching on around the world. Rigged models have 8’ of 150lb leader, a plastic thimble and a 10/0 # 3412 Mustad Hook.